Clam chowder is a hearty soup that is very popular in North America’s east coast, stretching from the Maritime Provinces till Manhattan and passing through Newfoundland and New England. The traditional recipe includes clams, potatoes, milk, cream and various herbs and spices. The word “chowder” actually derives from the French word chaudière (cooking pot) in which the Cape Breton sailors cooked this thick soup. Originally, chowders were prepared with fish, but they were later replaced with clams, which were less expensive and more accessible to the poor. Restaurants on the east coast of Canada and the United States always served this dish every Friday and during Lent, in order to offer the local Catholics a ‘meatless’ meal, as required by their religion. 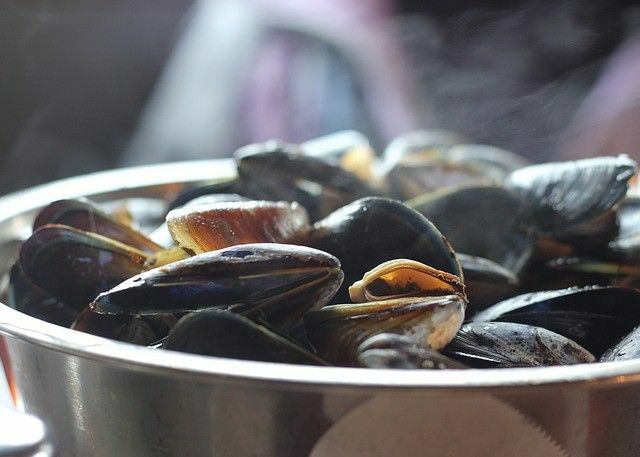 Nowadays, as even clams have become expensive, I suggest that you try out this traditional dish with a little twist – use mussels instead of clams. Originally published in the Journal de Montréal on March 27, 2010. « Looking for ideas for Easter lunch?